What a coincidence that today is National Chocolate Truffle Day AND National Avocado Day—because we combined these two ingredients to make avocado truffles. As chocoholics, we love to indulge in candy but it is not always that healthy. However, when we saw this 3-ingredient recipe in Health magazine, we knew we had to try these truffles. Dark chocolate is high in anti-oxidants and naturally low in sugar. Avocado has several vitamins and minerals and good monounsaturated fat that helps lower cholesterol levels. Celebrate two food holidays today with a guilt-free dessert and make avocado truffles. In a large bowl, melt the chopped chocolate according to the package directions (we melted our chocolate in the microwave for over a minute at half power). Stir until smooth. While it is cooling slightly, cut a small avocado and discard the skin and seed. Mash until smooth. Stir in 3 tablespoons of mashed avocado into the melted chocolate. Add a pinch of sea salt. Stir until smooth. Cover the bowl with plastic wrap and chill it for about 25 minutes or until thickened. Before taking it out from the refrigerator, sprinkle cocoa powder into a small bowl. Use a small scoop to make one-inch balls from the thickened chocolate ganache, shaping and rounding out each truffle in your hands. Roll it around in the cocoa powder to coat. Place in chocolate candy cups. Chill in an airtight container until ready to serve. Search our blog for more chocolate and avocado recipes. February is also National Avocado Month. Try mixing in a few drops of peppermint extract to the ganache. Or roll it in toasted coconut flakes, crushed nuts, a little ground cinnamon, etc. Below is a sample of original avocado truffles and others covered in unsweetened coconut flakes, chocolate jimmies and matcha green tea powder. We had a Brazilian classmate, Thaís C., in our Teaching English as a Second Language certification program. On “graduation day”, she brought in brigadeiros, her country’s version of chocolate truffles. The tray of treats was finished so quickly—and there were only four of us taking the intensive training course! Brigadeiros were named after the rank of Brazilian Brigadier Eduardo Gomes (1896-1981), an air marshal and politician. These chewy chocolate truffles are very easy to make and consist of only four ingredients—sweetened condensed milk, cocoa powder, butter and sprinkles. Thanks to Thaís for introducing us to brigadeiros and for sharing her recipe. Enjoy these Brazilian chocolate truffles on National Truffle Day. In a medium saucepan over low heat, melt the butter slowly. 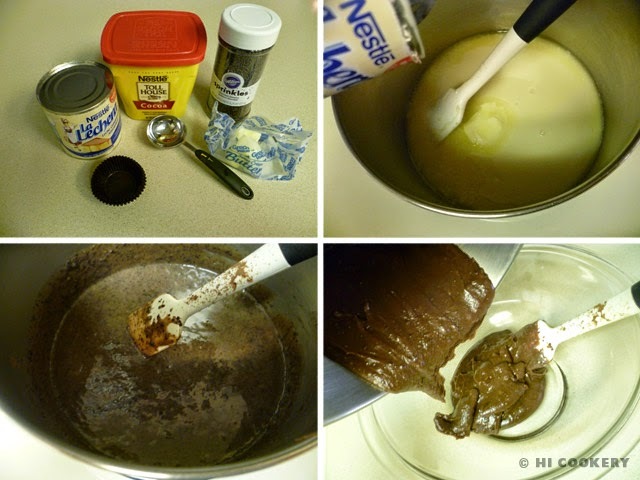 Add the condensed milk and cocoa powder, stirring constantly for about 10 minutes or until thickened. Be careful that the bottom of the pot does not burn. Transfer the mixture to a buttered bowl. Cool in the refrigerator for 30 minutes or until easy to handle. Butter or grease hands and roll mixture into one-inch balls (or use a buttered or greased scoop). Place on wax paper. 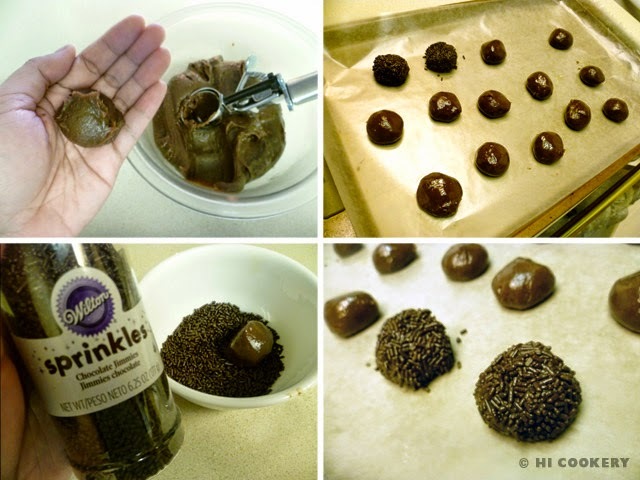 Roll each ball into a bowl of chocolate sprinkles. Place into miniature cupcake or candy papers. Chill until ready to serve. Yield: Approximately 15 brigadeiros. 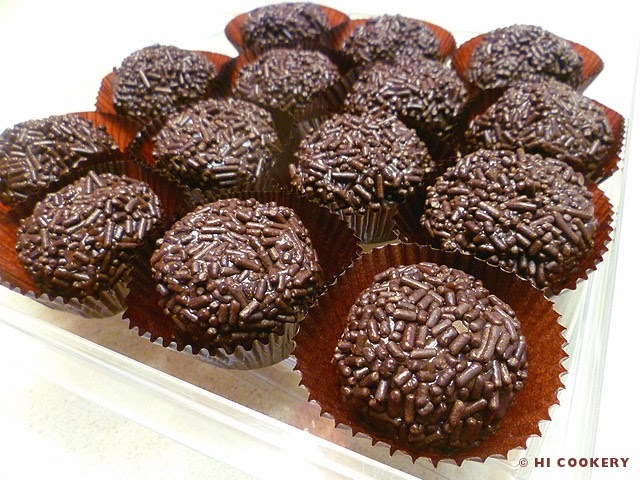 Brigadeiros may be coated in coconut flakes, chopped nuts or colorful nonpareils as well. These Brazilian chocolate truffles look like the black mushroom truffles! Search our blog for other Brazilian recipes. Bom apetite.